Last week, I came back from conducting a completely revamped production of Working at ACT of CT, a beautiful theatre in Ridgefield, celebrating its inaugural season. Led by Artistic Director Daniel C. Levine, Music Supervisor Bryan Perri, and Executive Director Katie Diamond, ACT was able to get special permission from the legendary Stephen Schwartz, who is both a Ridgefield resident and a member of their advisory board, to make serious rewrites to the book, and conduct 12 new interviews with local workers. They were beautifully integrated into the show through the use of a truly impressive video and projection design, making the musical a contemporary celebration of American Workers, instead of a time capsule period piece, which is a trap of the performing Working in its original version, written in the late 70s. For me, the score still holds up tremendously well, so that stayed lovingly intact, with some minor structural changes, one new arrangement, and the inclusion of two newer songs written by Lin-Manuel Miranda for the 2011 London Revival. With a versatile cast of six and a four-piece rock combo, I was so pleased with how the show sounded. I was also lucky to work alongside my wife Chrissy, who served as the standby for all three female tracks. "The cast is uniformly strong and vocally gifted. A live orchestra, under the direction of Dan Pardo, is superb accompaniment for the skilled performers." "The off-stage orchestra sounds fabulous, led by the masterful music director Dan Pardo, and, incredibly, even the individual songs written by so many different composers form a unified whole." "With such a range of musical collaborators, the songs are varied in their styles, but all land with a snap, and the unseen musicians pack a punch for what is essentially a rock band." "The talented live orchestra is led by conductor Dan Pardo on keyboards, and also features Matt Hinkley on electric and acoustic guitars, Arnold Gottlieb on electric and acoustic bass, and Dennis Arcano on drums and percussion." Fun Home came to a close this week, after nearly two months of pure bliss in scenic Vermont. The show, which served as the inaugural Equity production in Weston's new performance space, Weston Playhouse at Walker Farm, was a huge hit, and a joy for me to conduct. The houses were full and responsive; the reviews were fantastic, and the entire company - from the actors and musicians to the designers and run crew - got along famously. The show, directed by Malcolm Ewen, proved to be his last while serving as one of Weston's Founding Directors, along Tim Fort and Steve Stettler. "Dan Pardo, the music director, led the excellent five-piece pit band at the rear of the stage." "Transitions into song are elegant, and every word is spoken with the emotional freedom of music. The score by Jeanine Tesori quotes Motown and Chopin but chiefly moves energetically between plaintive and joyous." "Director Malcolm Ewen, with excellent assist from Music Director Dan Pardo, brings life and pace to this short chamber piece. 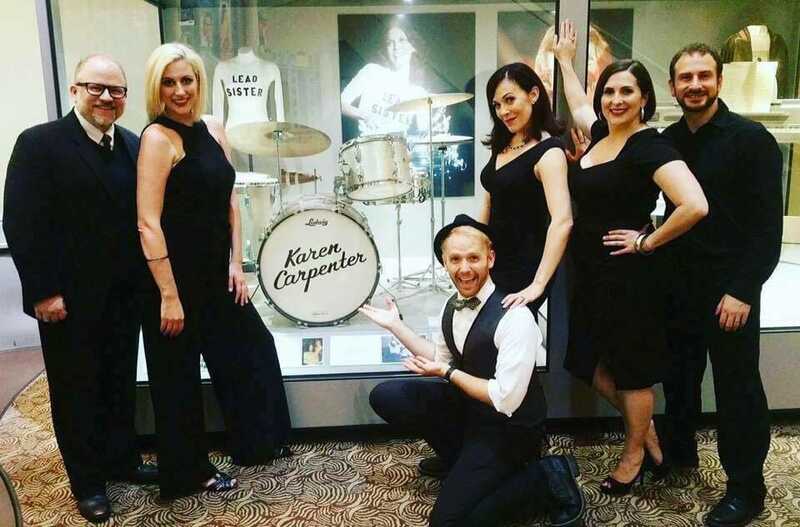 They have honed this fine cast into a perfect ensemble that presents us with a vibrant, rhythmic evening of musical pastiche and a courageous story tempered by irony and tenderness." 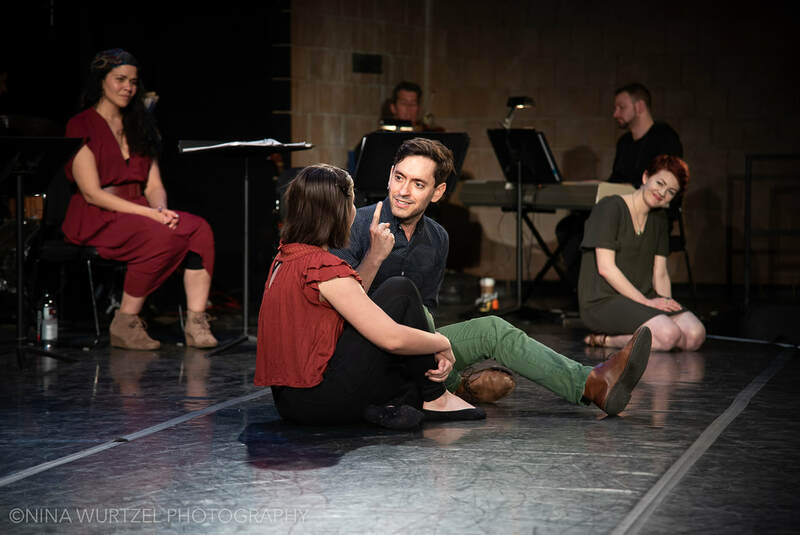 Massimo (Jacob Hoffman) sings and signs to his daughter, Orella (Catalene Sachetti-Manganelli) in the soaring ballad, "You Are the Only One" as Orella's voice (Nicole Vande Zande) and the Fortune Teller, Allegra (Alexandra Wailes) look on. ​Earlier this month, I finished up a reading of a fascinating new musical, Stepchild, by David Boyd and Chad Kessler. Performed at the LaGuardia Performing Arts Center as a part of the Rough Draft Festival, it was a riff on the Cinderella fairy tale, but set in the Italian Renaissance, with a deaf central character, named Orella. The Prince and the Fairy Godmother were also brilliantly portrayed by deaf actors, and the rest of the talented ensemble cast were hearing/hard of hearing actors, proficient in American Sign Language (ASL). The story was told for a diverse audience in various combinations of singing, signing, and captioned performances, and received a tremendous response. It was great to reconnect with some old friends, too, including multi-instrumentalist Joe Brent and director Kim Weild. With Michael O'Flaherty (music and lyrics) and LJ Fecho (book). All three of us hail from Reading, PA. It was so great to be back up at Goodspeed Musicals, my theatrical home, to music-direct a piece written by two of my biggest mentors: Michael O'Flaherty, Goodspeed's resident music director, and Larry Fecho, artistic director of Genesius Theater (which O'Flaherty co-founded in 1971, and where I grew up on and offstage). Hunter Foster directed, and Lisa Shriver providing the choreography and musical staging. The five-piece orchestration was masterfully done by my friend and colleague, Dan DeLange, with a superb cast led by Lenny Wolpe (Scrooge) and Michael Thomas Holmes (the Ghosts). With rave audience reviews (no critics are allowed at the developmental Terris Theatre), we fully expect A Connecticut Christmas Carol to become a perennial event for people in the "Greater Central Region of the Constitution State!" 'Company' is a HIT. Great reviews, Sondheim came, and we've extended! Wow. What a ride it has been, music-directing and conducting this production of Sondheim and Furth's Company at The Barrington Stage. 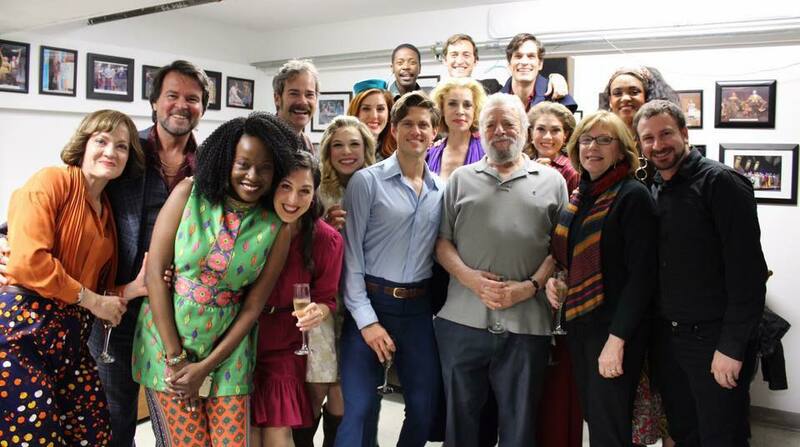 Tremendous cast, great audience energy (complete with the wonderful and endearing Tveiter-Tots —Aaron Tveit's Super Fans— who came to see the production over a dozen times), positive reviews, and as of last night, the approval of Stephen Sondheim, himself. It will be hard to let this one go, but as we were recently extended a week to September 10th, I won't have to! And that's what it's all about, isn't it? That's what it's really about, really about! "Role for role, this is the best-sung "Company" I’ve ever heard—not just in regional theater, but anywhere. Dan Pardo, the music director, doubtless deserves a big slice of credit for the quality of both the singing and the playing of the nine-piece orchestra." ​"Mr. Sondheim’s score remains thrillingly incisive, dramatizing every issue in its path. Problems of interpretation tend to dissolve when the songs are sung and played as well as they are here." "The orchestra, only nine strong, led by Dan Pardo, honors Sondheim’s musicality with strength and depth." "Indeed, the entire production, backed by Dan Pardo’s super pit orchestra, works splendidly in the nooks and crannies of Sondheim’s musical and literary imagination." "The expert music direction and conducting, of the nine-member pit orchestra, is by Dan Pardo"
Back in the Berkshires – MTC and Company at the Barrington Stage! With a background in education, I always like seeking out opportunities in educational theatre. Among the best programs for college-aged students is the Musical Theatre Conservatory (MTC) at the esteemed Barrington Stage Company (BSC) in Pittsfield, MA, not far from Camp Greylock, where I worked between 2008 and 2010. The summer intensive selects roughly 15-20 students each season with backgrounds in performance and directing, and provides mentorship and daily classes by members of the BSC Faculty, guest artists, and other master clinicians. Performance opportunities include a series of cabarets, certain education/press events, the student-driven "directors' projects," and an end-of-the-season showcase. Students also understudy various roles, throughout the season. It has been my honor and privilege to serve as resident music director for this fine program, which is now in its final two weeks. When I was asked to music-direct the 2017 MTC program, which is staffed through the education department, one of my hopes was that the experience would open some new doors for me throughout Barrington Stage, specifically as a music director/conductor down the road. BSC has had over 20 world premieres, including some big hit musicals like Spelling Bee. They also mounted the recent Broadway transfer of Bernstein's On the Town. Little did I know, their resident music director, Darren Cohen, was scheduled to leave the Berkshires early this season, and needed to find someone to conduct Company, starring the fantastic Aaron Tveit. To paraphrase a song from the show, "Someone [Was] Waiting," and that someone was me. We just finished our first week of rehearsals, and I couldn't be more thrilled. The cast. The material. The venue, all of it. Amazing. Excepting some individual concert pieces, Company will be my first professional Sondheim; it is also Chrissy's favorite show. Our first performance is August 10th; hope to see you up in the Berkshires! How to Succeed Keeps on Succeeding! On Inauguration Day, when I was more or less in a pit of Trumpian Despair, I was happy to discover that The 5th Avenue Theatre's production of How to Succeed in Business Without Really Trying, which I music-directed, was nominated for nine Gypsy Rose Lee Awards by the Seattle Theater Writers, the Emerald City's only professional Critics' Circle. Yesterday, the winners were announced, and I am thrilled to report that we took home seven awards (in bold print), myself included! I also have to add that the lovely Jessica Skerritt, recognized for her performance of Hedy LaRue, ending up losing to HERSELF, as she was nominated twice in her category, winning instead for her turn as Lina Lamont in Singin' in the Rain at Village Theatre. Congratulations, everybody!